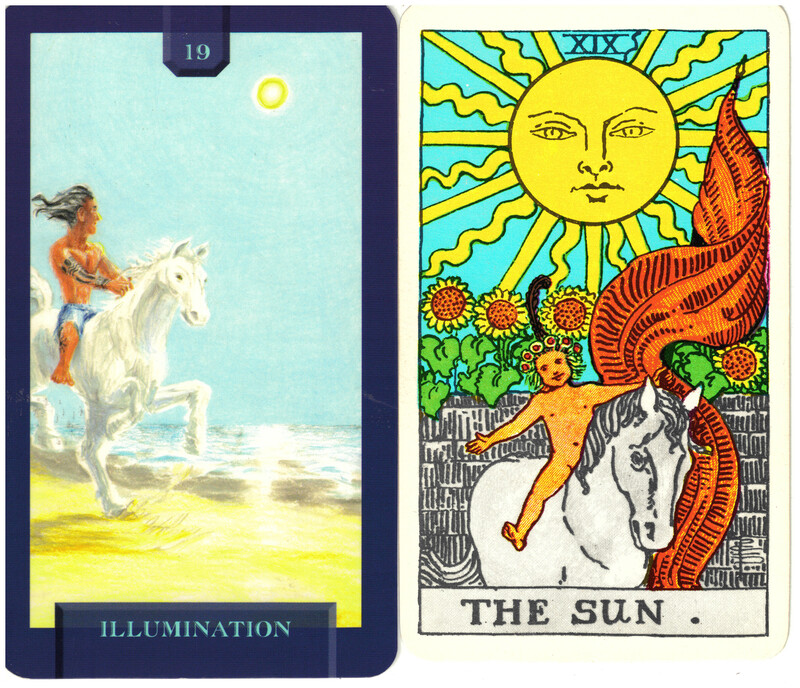 The Sun card from the Rider/Waite/Smith deck features a child astride a white horse waving a banner. Above him is the large and prominent sun and along a stone wall behind him are a row of sunflowers. This card denotes success and liberation as the child rides forth in positive contentment. The sun itself is the life giving force of the Universe, the vital energy that propels us forward. In the Today’s Journey Tarot card, Illumination, the horse and rider are empowered by the lack of constraint as they ride along a sun drenched beach. The idea here, like The Sun card is that the energy and freedom of this moment is one filled with joy, unlimited power, and true liberation. Illumination offers us freedom to master the world without limitation.